Satirical News: Toei Announces Upcoming Failed Hero Series "Squatterman"
Toei Ltd. is now proud to announce that after the success of its parody series in the past namely B.S. Man, Shippaiman, Gohan Heishi and Bakacop -- it will now release a new failed hero series called Squatterman. 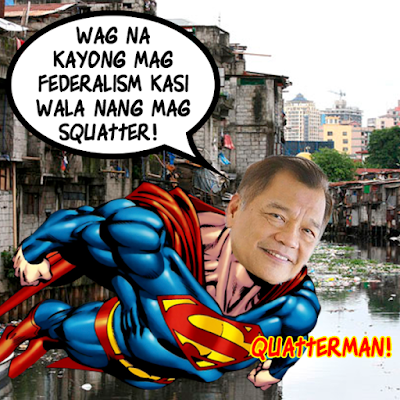 Squatterman is all about an incompetent member of the Japanese Council know as Joe Ritikake who passed a law that would allow squatters to have rights to squat in Japan. As a result, he was kicked out of the Japanese Council when he was found out to be using squatters as a private army. He went to the slum areas of Japan where he found the mysterious artifact known as the "Squatter's Cape". Wearing it -- he became the new "superhero" known as Squatterman. His mission in life is to defend the right to squat from the incumbent Japanese government. His actor will be played by Joji Nakata. Nakata himself played as Sir Kaura in Choshinsei Flashman and as Great Professor Bias in Liveman. He would later voice Azald in Doubotsu Sentai Zyuohger and as Roshuo in Kamen Rider Gaim. But now, he has decided to try out a new role known as Squatterman. Squatterman's closest friend is Mr. Oscar Hamada -- to be played by Akira Hamada. Mr. Hamada is a representative of a Japanese who hides in Australia and wishes to turn Japan into a welfare state. Mr. Hamada serves as the faithful sidekick of Squatterman. His opposition would be Japanese prime minister Rokio Daichi who will be played by Junichi Haruta (who appeared as Kanpei Kuroda in Goggle V, Ryu Hoshikawa in Dynaman and Mad Gallant in Juspion) and Japanese chief of police Ryotaro Deguchi who will be played by Strong Kongo. Also, the planned writing and production staff are as follows. Shinichiro Shirakura is announced that he too will be the producer of Squatterman -- all the while he would also work with Kamen Rider Zi-O. The head writer is currently planned to be Shoji Yonemura. However, Gen Urobuchi is still waiting for Toei's approval if he can be the secondary writer for the series. Squatterman is expected to air sometime this Winter 2018 for 20 planned episodes. Stay tuned for further developments!